Ask any new mother and they’ll all tell you about the overwhelming choices available in baby bottles. It’s often hard for one to choose let alone know which one is best for the baby. 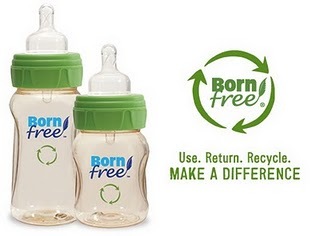 New Born Free considers themselves the first BPA-free bottle out on the market. Their new spokesperson and superfan Lynda Fassa is no stranger to the company and its products. Whole Foods was their first customer and Lynda oversaw their stringent interview process before giving them shelf space. Lynda is also Planet Green’s babies and families expert, author of two guides to raising children the organic way titled Green Babies, Sage Moms and Green Kids, Sage Families, as well as founder of her own organic cotton baby clothes company, Green Babies. She is one lady who really knows her stuff and took us through the many ways BornFree goes out of the way to stand behind their products and their claims – from owning their manufacturing equipment outright and vigorous testing at every step of the manufacturing process to being the only company that prints lot numbers on its products. Expanding on their successful product line, they announced the additions of a Twist’n Pop Straw Cup for the toddler set and 2 new BPA-free pacifiers – CoolFlow and Clear. They also wanted to walk the talk and with that in mind, they launched their new sustainability initiative. The first in the industry, BornFree currently will pay postage for the return of used BornFree bottles where they will recycle them into things such as toys, furniture and possibly other household goods. For more information on these new products and their new sustainability initiative, please visit them at www.newbornfree.com. thanks for posting this! they look so nice! just placed an order!